US-EU legitimacy is crippled as their Kiev regime uses overt, systematic violence and intimidation to consolidate its hold over Ukraine. April 15, 2014 (Tony Cartalucci - LD) - Ukrainian presidential candidate Oleg Tsarev was savagely beaten outside a TV studio after an interview for the Ukrainian talk show, 'Svoboda Slova.’ The studio was apparently surrounded by armed men in masks earlier, preventing Tsarev from leaving after the interview. When he did finally emerge, masked men with Svoboda Neo-Nazi "Wolfsangel" armbands began throwing objects at, choking, and physically beating Tsarev. Dramatic video of the confrontation was captured, and exposes the successors of the "Euromaidan" protests as not a "pro-democracy" movement, but a mob using violence and intimidation to disrupt and destroy all political opposition to their agenda. 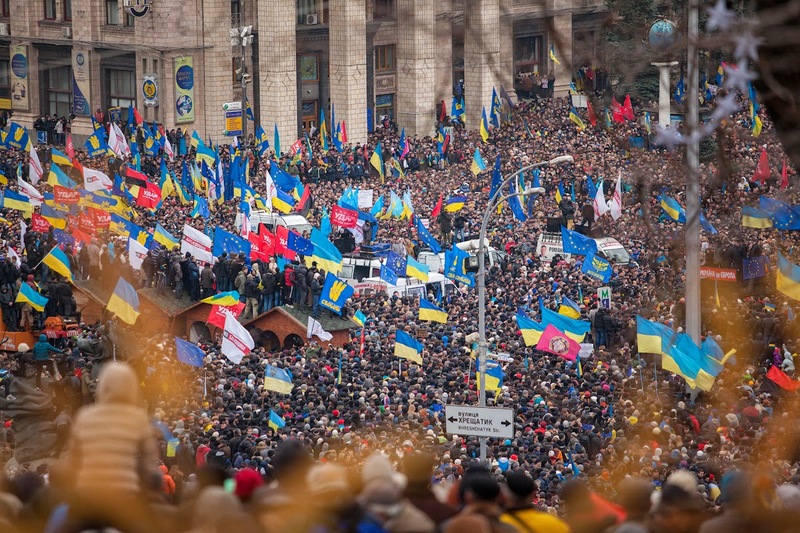 In an earlier report titled, " Ukraine: The Anti-Maidan Begins," the various components of the "Euromaidan" protests were broken down illustrating how violent Neo-Nazi fanatics and ideologues were the rule, rather than the exception in Kiev before the violent overthrow of the elected government of President Viktor Yanukovych. The mobs that attacked Tsarev outside the studio he had given an interview in, appear to have ties to Svoboda's street front, one of the central political parties that led the "Euromadian," and a party that now enjoys three top ministry positions within the newly installed Kiev regime. 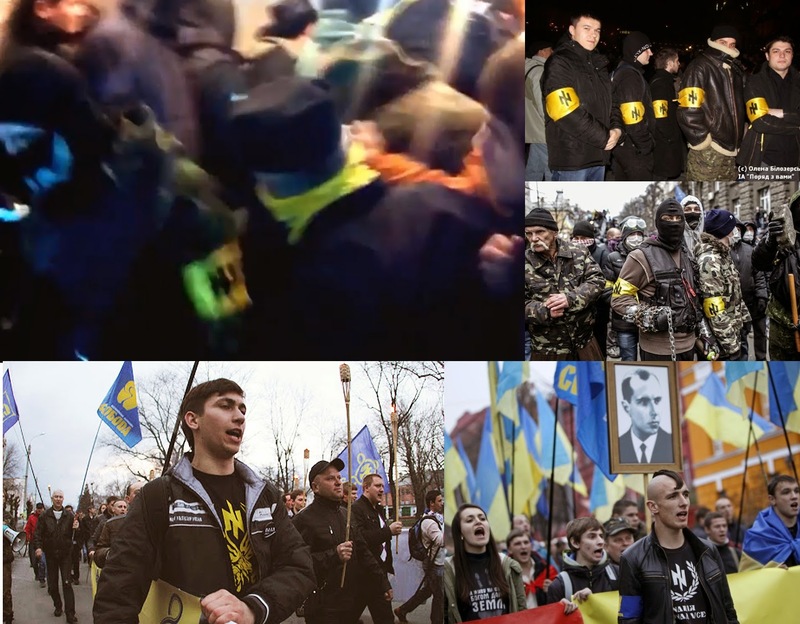 Image: Top left - thugs emerging just ahead of Ukrainian presidential candidate Oleg Tsarev can clearly be seen wearing the Svoboda Neo-Nazi "Wolfsangel" on yellow and black armbands. Shortly after they passed, other masked thugs would physically assault Tsarev, resulting in hospitalization. To the right and along the bottom - various images of Svoboda's street movement in action. Note the same yellow and black "Wolfsangel" along with the "three-fingered salute" of the official Svoboda Party flag. Image: Laying to rest any lingering doubts, images from "Euromaidan" rallies were frequently dominated by the yellow and blue Svoboda Party flags, featuring a three-fingered salute, intermixed with EU flags, and flags of Ukraine's other ultra-right, Neo-Nazi parties, including the "Fatherland Party," and Right Sector's crimson and black banners. As the regime in Kiev prepares a violent "anti-terror" campaign to subjugate eastern Ukrainians who wholly reject the unelected regime's seizure of power and its deliberate intimidation and deconstruction of their political rivals ahead of rushed elections, the savage beating of Oleg Tsarev by the regime's supporters must be kept in mind. It is these very tactics by the regime that is driving opposition across much of Ukraine's eastern and southern regions, including Crimea which has already decided upon and begun the process of integrating with Russia rather than remain under literal Neo-Nazis occupying Kiev. The Western media will continue covering-up, spinning, and otherwise compartmentalizing the violent, authoritarian regime in Kiev - but acts like the beating of Oleg Tsarev will make this task all the more difficult, and the likelihood of the regime ever establishing any sort of legitimacy slim if at all possible.